The link between handmade gentlemen’s ties and steel framed windows may not be glaringly obvious but the two share one specific quality. 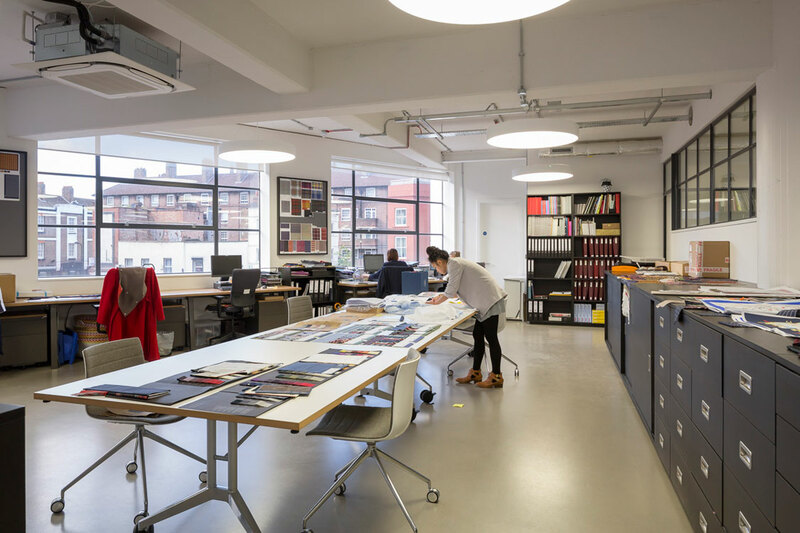 Both are expertly crafted British products and it was this connection that has helped bring the two together in a prestigious building renovation in East London. Haberdasher Street is the appropriately-named location for the new headquarters of Drake’s London, a firm that since the late 1970s has specialised in the design and manufacture of men’s ties. 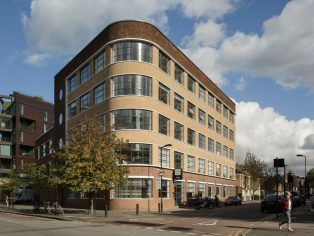 The six-storey 1930s concrete-framed building occupies a prime corner site in the heart of what is actually the East End of London’s burgeoning tech city neighbourhood. 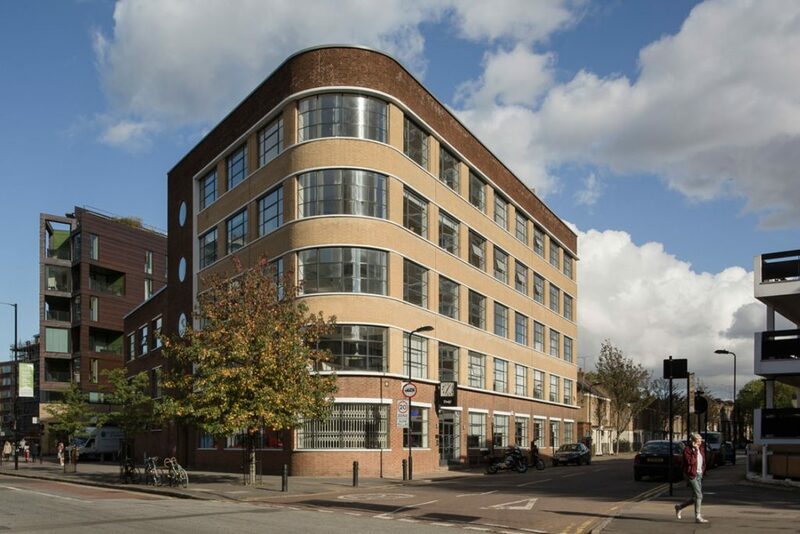 Nevertheless, it was here that the leading menswear accessories manufacturer chose to relocate its Clerkenwell-based workshop and its Rotherhithe-based distribution centre. These have now been consolidated into a new London HQ. The project also yielded sufficient room for office space and nine apartments to rent. The building was formerly a factory and this usage has now been restored with Drake’s occupation of it. Ugly, uPVC windows had to go, especially the ones that had obliterated the curved fenestration on the building’s impressive corner elevation. The slender frames and consequent increase in glazed area inherent in a Crittall window provided the maximum amount of natural light and so the decision to specify Crittall was not just purely aesthetic but also practical and functional. Hawkins\Brown arranged for Drake’s senior management to visit Crittall’s Braintree, Essex, factory to see the windows being manufactured. Both Crittalls and Drake’s share a passion for craftsmanship producing items that are well made, long lasting and authentic while being progressive and relevant. It was, in other words, a perfect fit, not least around the building’s corner elevation where curved glazing has been restored. The building’s top two floors accommodate warehouse-style apartments with the same fenestration as found on the lower floors but with acoustic ventilation to meet Parts E and F of the building regulations. Hawkins\Brown’s refurbishment opens up the original building, stripping it back to its concrete frame whilst retaining and reusing original features including a caged lift and balustrades in the stairwell, porthole windows, concrete canopies and the street frontage clock which has been refurbished with Drake’s branding. Glazed Crittall partitions were also specified internally to create a light-filled and spacious working environment with extensive views to the outside.